Tantraz doesn't have the best Indian food, but this special occasion Indian restaurant scores peppers for its creativity, customer service, unique decor, and club nights. Fellow blogger TikiChick explores it with me. 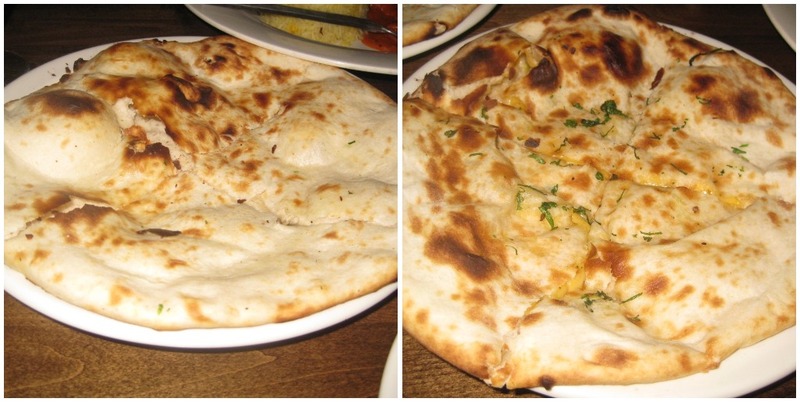 The Details: In Southern California, there are literally hundreds of Indian restaurants. I know this well, because Nick and I did the research before I embarked on this blogging adventure. (Well, Nick did the research anyway. He is way better at estimating than I am. My original analysis was, "Babe, there's only, like, 10 Indian restaurants in Los Angeles." As a rebuttal, teacher that he is, he had me recite the names of the ones I'd already been to...yeahhh, there was at least 20 restaurants right there, and turns out that doesn't even scratch the surface.) Of these hundreds, there are no more than 10 (I got it right this time!) that are "special occasion" restaurants. 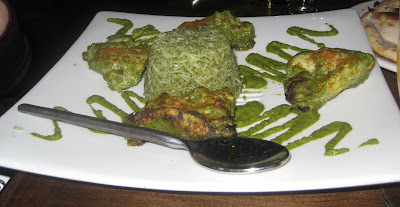 Some of the ones that spring to mind are Tanzore, Chakra Cuisine, Electric Karma, and Tantraz: The Art of Indian Cuisine, subject of this blog post, in Silver Lake. I lucked out because for this review, my friend and fellow blogger TikiChick and her boyfriend joined Nick and me. It's really great to go out with someone else who, like me, is constantly blurting out "Don't eat that yet! I need a picture!" in the middle of otherwise sane conversations. She also understands the value of experiencing as many things as possible on the menu, so she's generous with sharing food off of her plate. Her boyfriend, frequently referred to as Mr. Baseball on her blog and I won't blow his cover here, is also a great sport (pun intended, yes I'm a dork) and he and Nick were able to talk their hearts out about baseball, while TikiChick and I discussed the food. Tantraz doesn't have the best Indian food, but it doesn't have to. What it has going for it are creativity, excellent customer service, a unique decor (TikiChick loved it; it was a little too bank-vault-esque for me, but again, I give it creativity points), and apparently has club nights with a live DJ and dancing (which I may have to go back and check out sometime). The customer service started from the minute my reservation request phone call was returned, when the employee took the time to ask me, "Are you celebrating something special?" (On a negative note, the restaurant is no longer on OpenTable, so when I first tried to make a reservation at 3 a.m. when I finally got some spare time, I wasn't able to do so. But my phone call was returned within a few hours.) I'm pretty sure the restaurant is open for only dinner, and I'd definitely recommend getting a reservation on weekends at least. 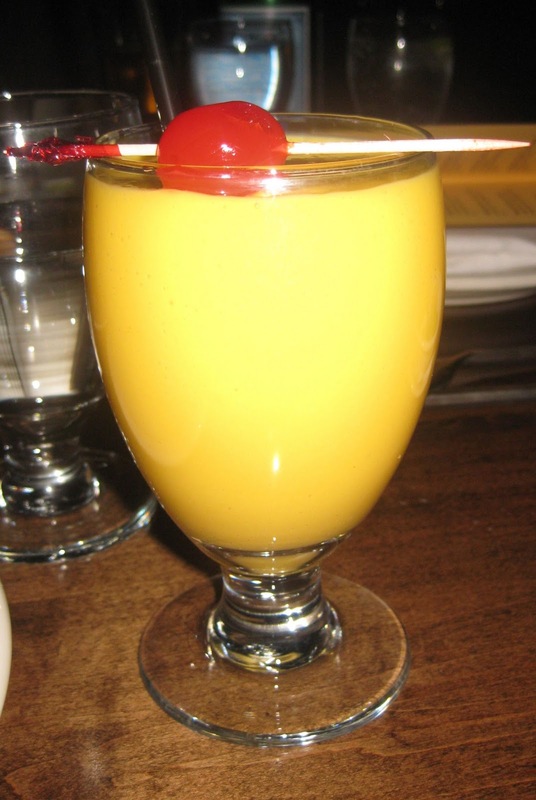 Once I saw TikiChick with a stylish Mango Lassi with a cherry on top, I of course had to order one for myself. I am so glad I did. This may be the best mango lassi I've ever had; it tasted really authentic and had a perfect balance of flavors. Nick and I arrived after TikiChick and Mr. Baseball, so the complimentary Papadum was already on the table when we arrived. Creativity and unique fusion was apparent in the rest of our orders for the night, including the Assorted Samosas appetizer (We got two orders; each order has three samosas.) 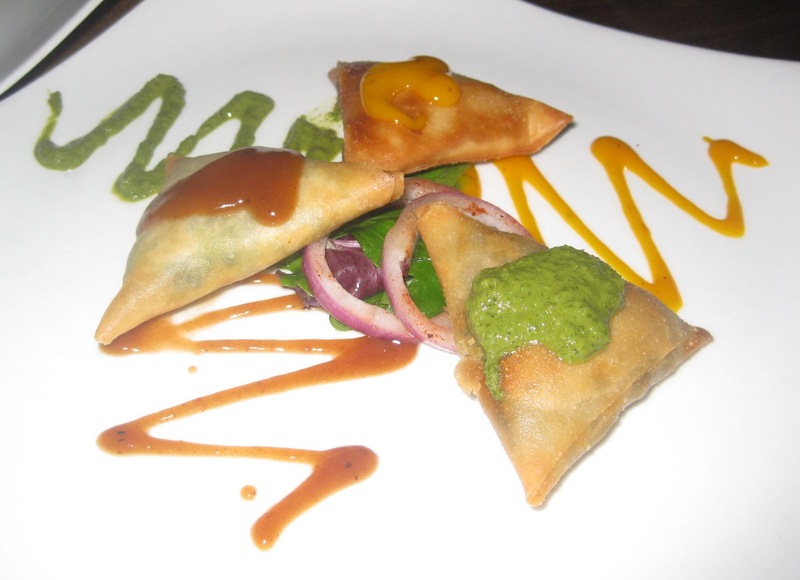 These were filled with mango & cheese, spinach & tofu, plus a traditional potato & peas one. The mango one had a mango sauce drizzled on it and cheese inside, but taste-wise it tasted like potato with a slight mango taste. The actual potato one we at first mistook for the spinach one, because it looked green inside -- but we realized after a few bites that was the peas. When we figured out which one was truly the spinach one, I tasted it and that one was my favorite. It reminded me of spanakopita. 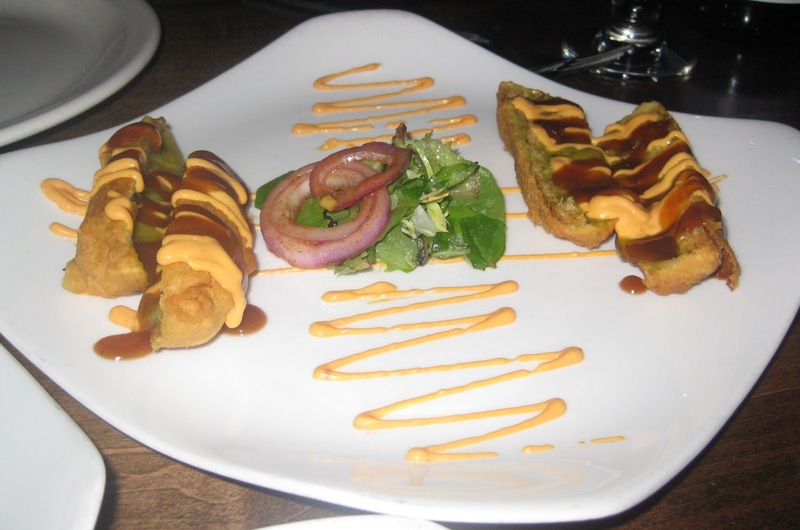 We also ordered a second appetizer, the Murgh Seekh Kebab, crispy chicken rolls filled with masala cheese. The cheese was not Indian paneer, but rather seemed to be a cheddar mix. 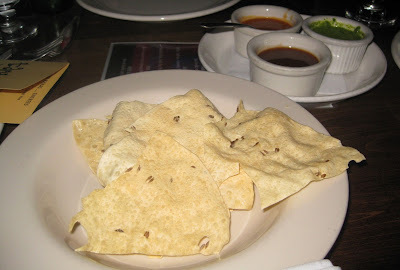 I liked this dish, but it didn't taste Indian really, except for the masala sauce. Mr. 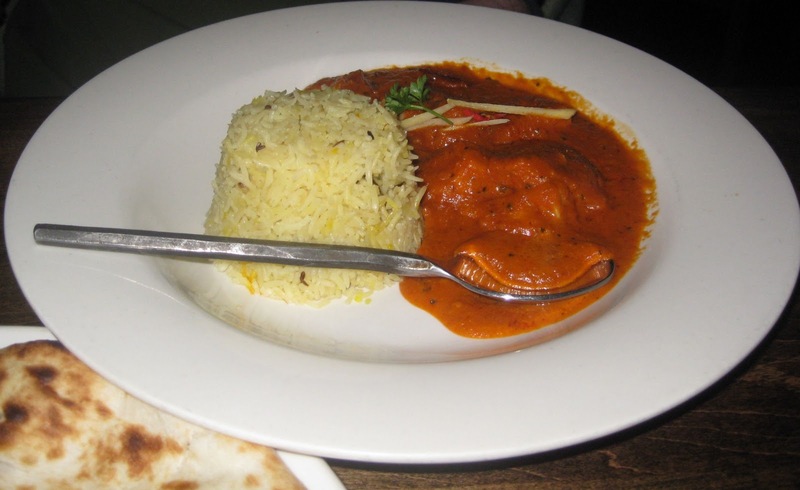 Baseball hadn't had Indian food in a long while and his last experience was a negative one, so we recommended he order the perennial palate pleaser: Chicken Tikka Masala. He liked his choice, though he, TikiChick and I all agreed that the sauce was unusual in that the usually gentle tomato-based sauce had a spicy kick aftertaste. I thought this unusual kick made Tantraz's chicken tikka masala unique and I give it props for that. 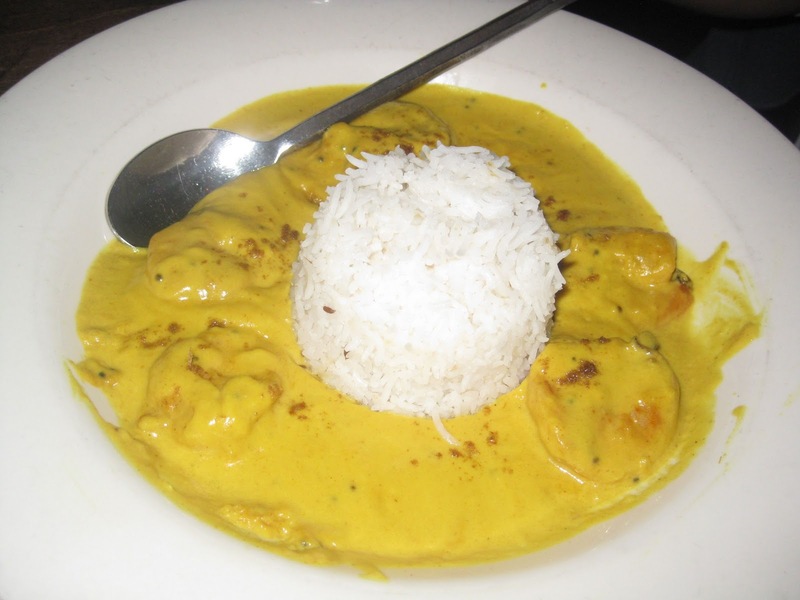 Nick ordered the Shrimp Coconut Curry, which featured jumbo shrimp, coconut milk, curry leaves, and basmati rice. He liked the coconut sauce with the naan, but didn't care for it with the rice. Of our four entrees, I personally liked his the best. 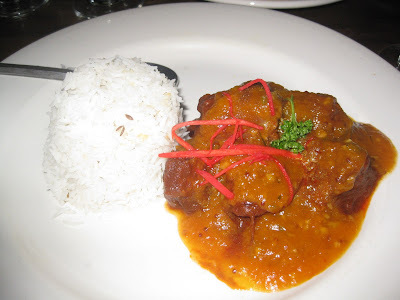 I got the Apricot Lamb, which is a lamb fillet covered in apricot-curry sauce and served with basmati rice. I'd never seen this dish on an Indian menu before, and I was intrigued. Our server gave it a high recommendation. My opinion is mixed. I generally love the juxtaposition of sweet and savory in meat entrees, like mango chunks on top of baked chicken and the Persian dish of fesenjan (chicken with sweet pomegranates), but sweet and savory seems to work best with white meat dishes -- like chicken or pork. With a dark meat like lamb the sweetness doesn't really sink in. So, the lamb by itself was good and the sauce by itself was good, but together they didn't really combine properly. The bites were tastiest when I cut the lamb super thinly, then covered the slice with the sauce. All in all, I wouldn't personally order it again, but if you like lamb and are open-minded, you might really like it. I was so full that I had to box up some of my entree to go, but I had to know what creative dessert options the restaurant offered. Everyone obliged me, and we wound up sharing an order of Chocolate Samosas. Served with ice cream, these two samosas were filled with melted dark chocolate and were super crispy. The presentation was great, the samosas were a bit hard to slice into, and the taste was just OK.
All in all, I'd definitely come back here on another date with Nick or with a group for a birthday dinner or club night. Price-wise, it's more affordable than other special occasion Indian restaurants, specifically Tanzore and Chakra Cuisine. The only other thing you need to be aware of is a downer, and that's the parking. In short, it blows. Be prepared to spend $5 to valet at the restaurant. TikiChick and Mr. Baseball were more familiar with the area (and weren't running late like Nick and I were), so they were able to get free parking on a neighborhood side street. Check the signs for parking restrictions and to see what time the meters stop being enforced on Sunset (I want to say 8 p.m.). I'm no tiki bar expert, but I loved this place. It's small and dive-y, but the decor is amazing and much of it is from customers. 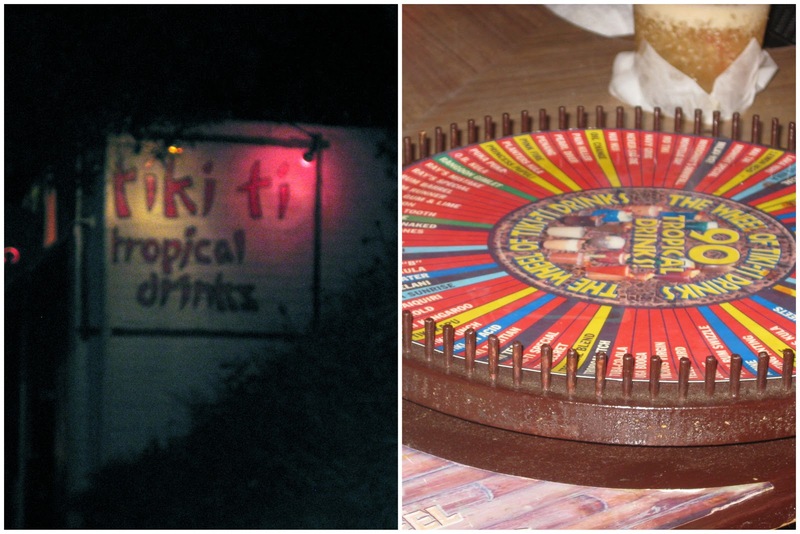 TikiChick gave us a rundown of some of the highlights, including The Wheel of Tiki-Ti Drinks. If you can't decide on a drink, just spin the wheel (which contains 90 tropical drinks) and let it make the decision for you. We got (from left to right): Navy Grog (courtesy of the wheel), Sweet Lelani, Bayanihan (my fave), and Ray's Mistake (Tiki-Ti's signature drink). I definitely recommend Tiki-Ti, though get there early (by 10 p.m.) for a better chance at not not having to wait in line, as it does regularly reach capacity. 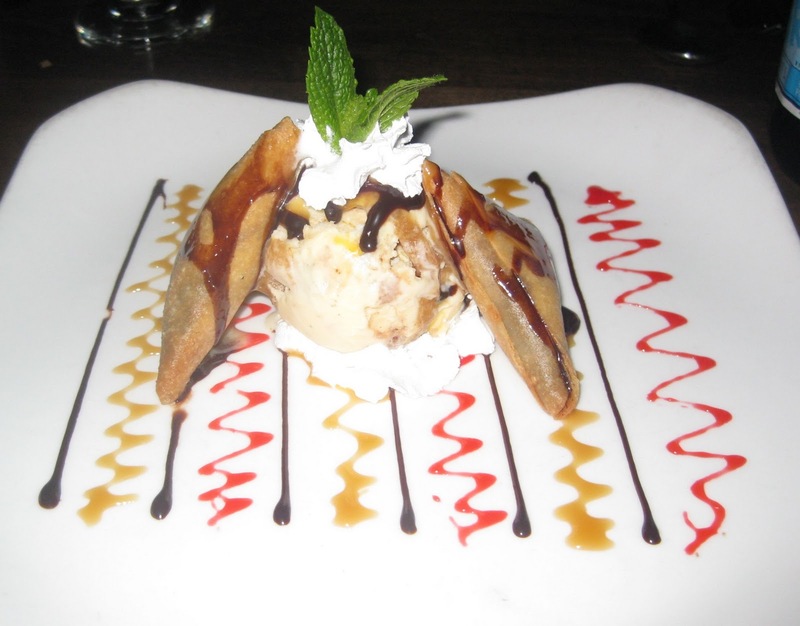 What's your favorite special occasion Indian restaurant? 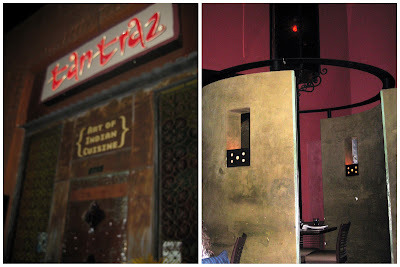 Tantraz: The Art of Indian Cuisine, 3705 Sunset Blvd., Los Angeles (neighborhood: Silver Lake) 90026. (323) 663-8268. So glad you liked the Tiki-Ti! That was a great night. I have a major problem with restaurants that don't participate in Open Table. It is SO much easier to make a reservation online than to try to call and wait for a call back! Anyway, this place looks pretty amazing - I don't get out to Silver Lake often (or ever!) but I do believe this merits a trip. I LOVE reading your blog because I am always on the lookout for a decent Indian restaurant in LA. I'm realizing that I have to leave the Westside for tha to happen! Your blog is amazing! Love your food and drink choices, and the descriptions of the flavors and setting. Can't wait to see your next restaurant review. Thanks for the hunger-inducing post. I'll have to drop by the place sometime. Hopefully the owners have restaurant insurance for their unique establishment. This is interesting. Where to find these products please?